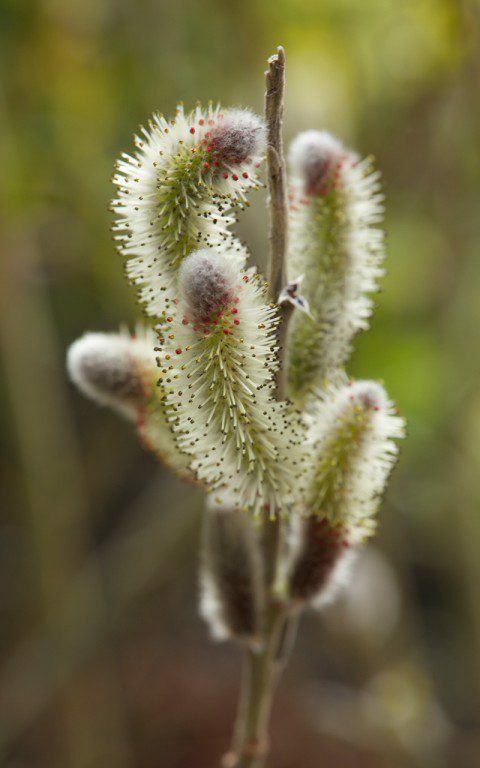 Willows – Dig Delve – An online magazine about gardens, landscape, growing & making. The first winter at Hillside I began the search for the palette of plants that would do well here. Brightly lit open ground with wind from all directions has been a strong influence, but a plant that feels right is just as important as one that suits the conditions. I expanded the old vegetable plot and laid out a series of experimental beds to trial plants in order to find the ones that would work. 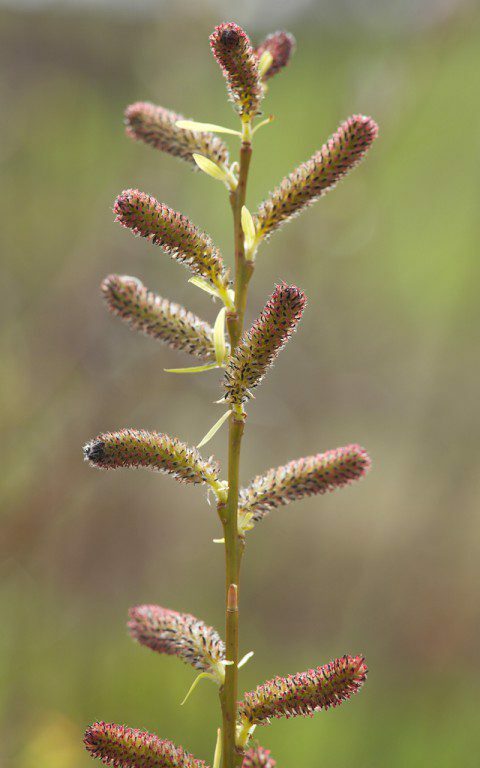 In the case of the willows, it was an opportunity to learn more about a group of plants that I had long wanted to get to know better, but had never had the room to do so. 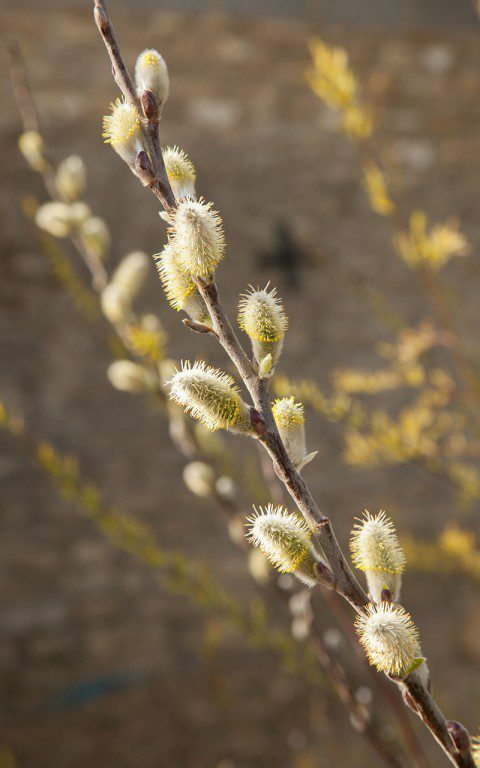 I’ve planted a catkin wood for clients in Devon and grown a few trusted varieties where room permitted, but there is no comparison to growing something for yourself to find out what does well, what doesn’t and whether the character of a plant is right for your situation. Most importantly, I wanted to see if the willows could help me make the shift from the ornamental domain of the garden to the wilder surroundings, which are the greater influence. 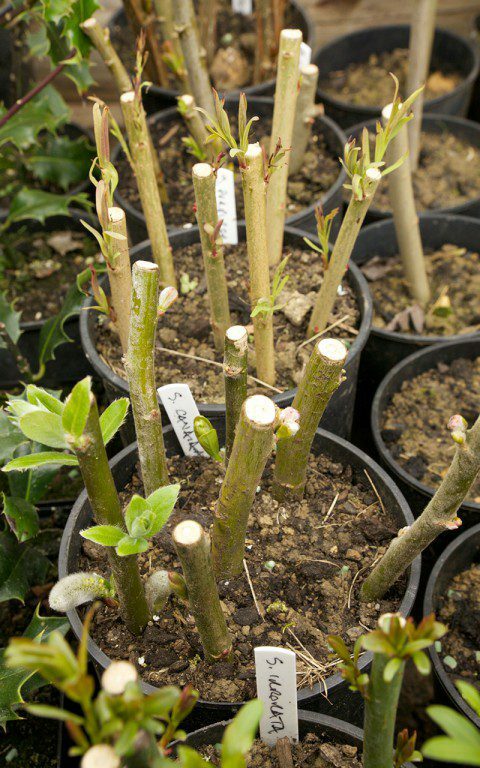 Ten or so different forms were ordered from Edgar Watts as hardwood cuttings. Bundled up tightly and carefully packaged, they resembled sticks of explosive and took to their new territory with similar vigour. I lined them out at the bottom of the new experimental garden to provide shade for the hellebores, which had been moved with us from the old London garden.That spring the cuttings rooted without looking back. Willows are notoriously fast and are known for their far-reaching roots and bad behaviour where buildings and drains are concerned. Yet their vigour and lust for life are good to harness in a new garden and, used with care, they provide good company. The first year after planting we saw the little rods jump up to a height of a couple of metres, catching the wind, their branches shimmering. Winter revealed the coloured stems, which are brightest on new wood . 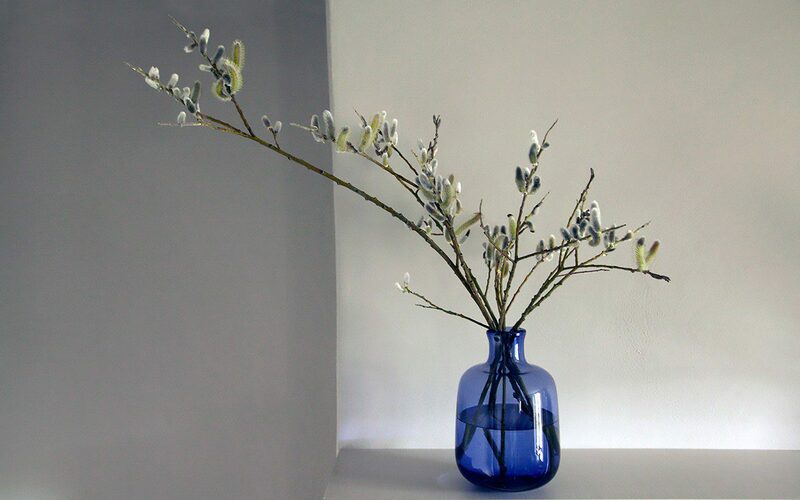 A chalky blue dusting on the Salix irrorata and limbs as dark as mahogany on the Salix daphnoides ‘Aglaia’. Each were different and offered potential. The following spring, just over a year after moving, we had the first catkins. These appear over the best part of two months and bridge the winter shift to spring. Salix gracilistyla appears with the snowdrops as early as February, the silvered catkins densely arranged along neatly growing branches. 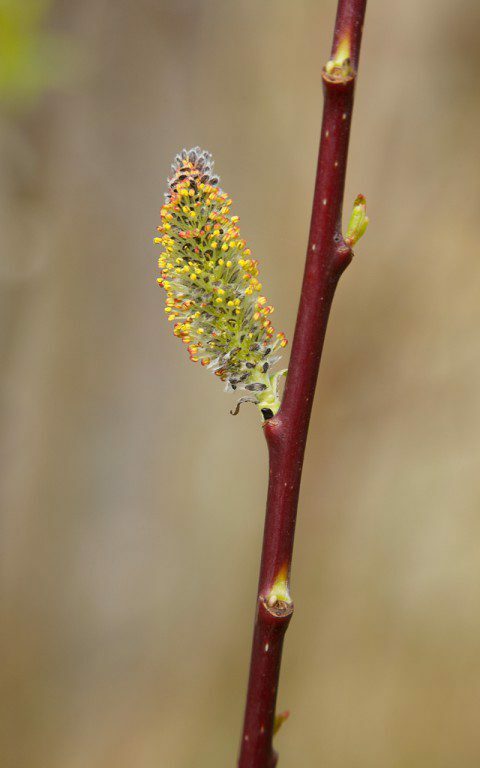 Salix gracilistyla ‘Melanostachys’, the black willow, is the form of this species most readily available. It has black catkins, as dark as charcoal. It is still on my list of willows to try and I plan to use it with an underplanting of shiny ebony-leaved Ranunculus ficaria ‘Brazen Hussy’ whose golden yellow flowers will throw their darkness into relief. 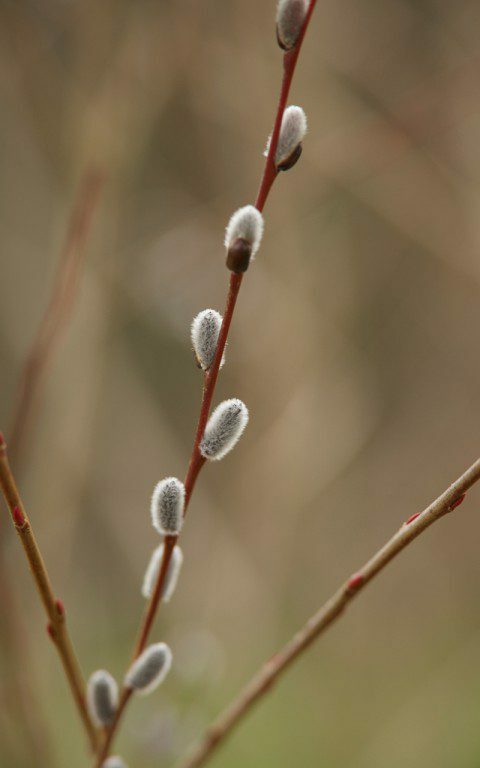 Salix candida, the last to bloom almost two months later, has the largest of all the catkins. The growth is muscular and obviously up to roughing it on North American coastlines, where it originates. Summer foliage is pale and silvery-green. It blooms in the stock beds with an undercurrent of lungworts and is much loved by early bees, which drone in its branches. I have also added Salix purpurea ‘Nancy Saunders’ to banks of the brook. This is a refined form of our native Purple Osier with delicate grey green foliage and wire-fine, mahogany branches which age to pewter. A myriad of tiny catkins break silver, then grey as they open to reveal their pollen. I also have cuttings of Salix purpurea ‘Howki ’ a green leaved form of the Purple Osier, which flowers earlier than ‘Nancy Saunders’, which will also be moved down to the brook to grow in the wet meadows there. Early in the season they will flower above the primroses but, come the summer, they will be all but invisible amongst meadowsweet and hemlock water dropwort. Five years on and in readiness for planting up the new garden this autumn, I find myself with a frame full of fresh cuttings. The trial beds will have been removed by the time these are potted on and will be ready to go back in to create a newly defined meeting point between garden and landscape.